Here is another collar. This one is crocheted and in excellent condition. It can be worn for many more years. That is why I spend time making crochet lace. I know it will last for a long time. The neck opening on this collar is very small, about 13 inches. Women have gotten bigger so it may have been a lady’s collar. It would also be bigger if it didn’t close all the way. A button placket down the front would add an inch or so. The steep curve in it’s shape means that on the body it would lay flat around the neck. The padded rings are not easy to make. This is because they are formed with a treble stitch. That means carefully controlling the placement of the first loop, so that all the stitches over the padding are the same size. Sounds easy, but I have had trouble making trebles around rings. I had to concentrate on forming each stitch. It is not that common to make them this way. More common is to do a row of singles followed by a row of doubles. Taller stitches make it possible to get more stitches in a tighter ring, so that is why it was done this way. Whoever made this collar did a really nice work. I think this collar would look cute on a little girl’s dress. It has a playful quality that makes it a fun piece of lacework. Close up photo of the treble stitch padded rings. 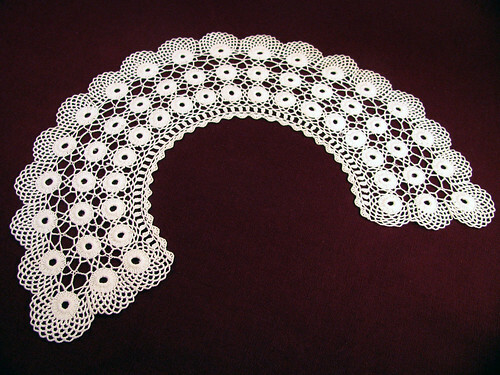 This entry was posted on Wednesday, March 18th, 2009 at 3:00 am and is filed under Crochet, Lace and Vintage. 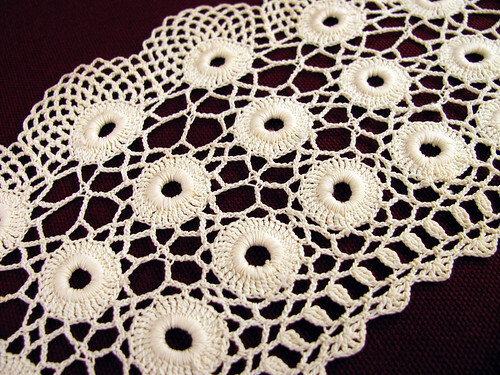 Tagged: Crochet, Lace, Needlework, Vintage. You can feed this entry. You can leave a response, or trackback from your own site.